I'm still digging out from weeks old emails and putting away the hiking boots and sorting through the many many pictures we took (on one camera and three phones), so the vacation re-cap is yet to come. The day we got home, there was - predictably - nothing to eat. Except that the pantry had dry pasta, olive oil, garlic, salt and pepper, and the fridge had a tired but serviceable lemon, and the garden had parsley and basil and tomatoes! 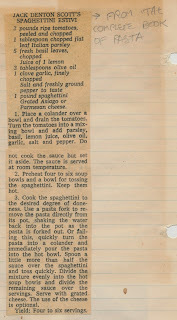 And so, dinner was had: Jack Denton Scott's Spaghettini Estivi. 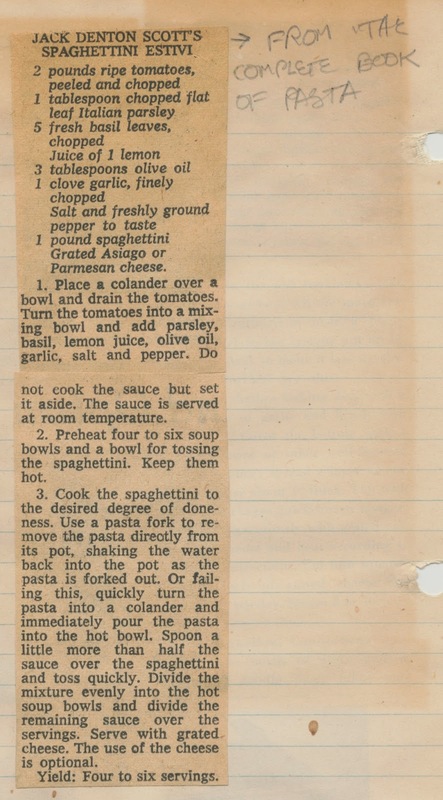 This is a pasta dish that I grew up with - my mother had ripped it out of the New York Times and pasted it into her black notebook of recipes, with a note that it was from The Complete Book of Pasta. We used to eat it on summer Sundays, when we'd been at the beach all day (and weren't having a grilled London broil and some fresh delicious buttered corn). It's so easy - chop up a bunch of tomatoes, season them, and toss the uncooked sauce with hot pasta. If we're feeling fancy, we'll do a caprese version of the same - adding cubed mozzarella and subbing balsamic vinegar for the lemon juice. In fact, we eat that version more than this one because there's a guy at the farmers market with fabulous fresh mozz, so when we eat this more spare, lemon juice version it feels revelatory each time we decide to have it. And even though it's called spaghettini estivi, I usually use a short pasta like rotini or orecchiette because I like eating it with soup spoon. But I still call it spaghettini estivi, just because. You probably have all of the ingredients already, so try it. 1) In a big bowl, mix together the tomatoes, parsley, basil, lemon juice, olive oil, garlic, salt and pepper. Do not cook! Put it aside. 2) Cook and drain pasta, and add to tomato mixture. 3) Serve, with grated cheese, as desired. We do a very similar cold sauce but we add chopped kalamata olives. I love the artifacts from our mother's kitchen. I, too, found recipes from newspapers, clipped and sandwiched between pages of her favorite cookbooks. Every once in a while I find a new one, and it's just as good today (maybe better, for its simplicity) as it was then, so many years ago.